The sun sets behind Launch Pad 39A at NASA's Kennedy Space Center in Florida with space shuttle Atlantis awaiting launch at 2:28 p.m. EST Nov. 16 on its STS-129 mission. WASHINGTON ? The space shuttle Atlantis is poised tosoar into space Monday to ferry six astronauts and tons of spare parts to theInternational Space Station. Atlantis is slatedto lift off at 2:28 p.m. EST (1928 GMT) from Launch Pad 39A at NASA'sKennedy Space Center in Cape Canaveral, Fla. A pristine 90 percent chance ofclear skies is predicted. "The weather is looking very good for launchday," shuttle weather officer Kathy Winters said. Atlantis' STS-129 mission will be an 11-daytrek to the orbiting laboratory to deliver two massive platforms packed with spare parts, including pump modules, gyroscopes, ahigh-pressure gas tank, a latching end for the station?s robotic arm, batteryequipment, a cargo transportation container, and more. In all, Atlantis willcarry about 27,250 pounds (12,360 kg) worth of supplies. "This flight is all about spares - basically, we?regetting them up there while we still can," said Brian Smith, the leadspace station flight director for the mission. 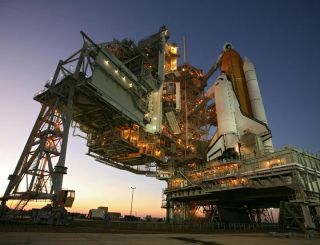 The supply run is vital to pave the way for the future, whenNASA plans to retirethe space shuttles and their capacity to carry up large hardware to space. "We're looking for the long-term outfitting of thestation, making sure that ISS is ready for the long haul and has the longestlife capability possible," said mission commander Charlie Hobaugh in apreflight news conference. The shuttle fleet is due to retire in the next year or soand be replaced with new rockets and spacecraft, though NASA?s humanspaceflight program is under review by the Obama administration. To set up the new spare part carriers, which will beattached to the station's backbone-like truss, the crew plans complex roboticwork and three spacewalks, or EVAs (extravehicular activities) in NASA parlance. "All of the tasks in each one of the EVAs are complex,and we've just been training to keep our focus until we're back in the airlockand safe," said mission specialist Bobby Satcher, one of three crewmembersslated to perform the spacewalks. Satcher and crewmate Leland Melvin arechronicling their spaceflight online using Twitter, with Satcher writing underthe name Astro_Bones and Melvin as Astro_Flow. Atlantis' other STS-129 crewmembers include pilot Barry"Butch" Wilmore and mission specialists Mike Foreman, Randy Bresnik andMelvin. Wilmore, Satcher and Bresnik will be making their first trips to space. "I'm looking forward to floating around inweightlessness; the ascent itself I hear is just remarkable," Wilmoresaid.